Hikari Scissors feature models with the exclusive Hikari five finger ergonomic positioning system with a unique handle that truly fits like a glove and feels like an extension of your hand. Did you realize that Hikari's Ergonomic Positioning System (EPS) is the most requested feature among the top Platform Artists and Educators. EPS is featured on a select few products including the newest, Hikari Spark. Unlike any other scissor manufacturer, Hikari is the only company that can truly look at a scissor from a stylist’s point of view. Being founded by and still run by hairdressers, they have the insight no other company has. They have first hand experience and genuine understanding of the true benefit a stylist can have from their tools. Utilizing that background with superior craftsmanship that is unmatched in the industry, Hikari has designed the highly sought after five finger ergonomic positioning system. 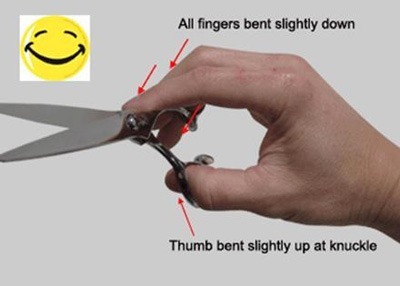 The most comfortable and stress free position for your hand is when all four fingers are bent slightly down and the thumb is bent slightly up. 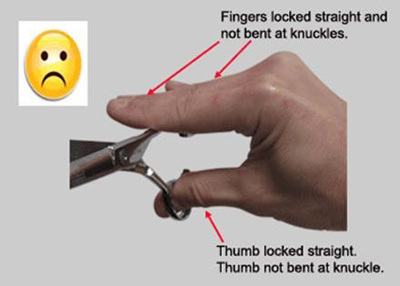 Keeping your thumb slightly bent at the knuckle is critical in avoiding stress to your thumb, hand, and wrist. The exclusive Hikari five finger ergonomic positioning system incorporates a handle shank, ring finger hole and pinky rest that are all angled slightly down. The thumb hole is angled slightly up. Each finger surface is beautifully sculptured with a wide surface area. This keeps your fingers and thumb in the most relaxed and natural position. The unique handle truly fits like a glove and feels like an extension of your hand. 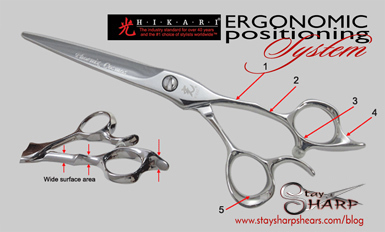 If you are interested in owning a pair of the "most comfortable and stress free shears", please browse our complete collection of Hikari shears and then contact us so we can help you secure a pair for yourself.